As far as I'm concerned when it comes to golf polos, there are only two brands: Nike and Adidas. I've tried many others, but they feel cheap and don't add up. I like this Adidas Navy Blue Shirt. It's the lightweight CoolMax Extreme design. It's 100% polyester with a rib-knit collar and open hem sleeves. The shirt has UV protection and is anti-microbial. The reason I like it is because it breathes and moves with you when you swing the golf club. The shirt does not absorb water, rather it wicks it away and keeps you dry. Most of all, I like the mesh side panels. This is worth the price of the shirt alone, especially on hot humid days. The only negative thing I can say about this particular shirt is I may go with a lighter color. 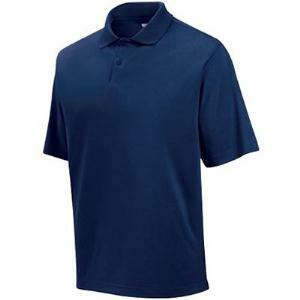 Most of my golf polos are light, and thus stay cooler than the dark blues or blacks. Also, make sure you check out these Nike Striped Polos. They have the Nike Dry Fit Technology that accomplishes the same as the CoolMax Extreme. Both brands are incredibly comfortable. Whether its Adidas or Nike, you can't go wrong. These are the best products on the market.